This originally ran on Reel News Network. I'm reposting here as personal use for my blog/portfolio. Two-time Hunger Games challenger Peeta Mellark is destined for stardom once more as the Capitol announces plans for the first annual baking contest to air on live television. The show will feature seven of the Capitol’s best bakers as they compete in rigorous challenges to earn the title of Master Baker and the chance to win their own upscale bakery. It is currently in the final stages of production and expected to air this Spring. 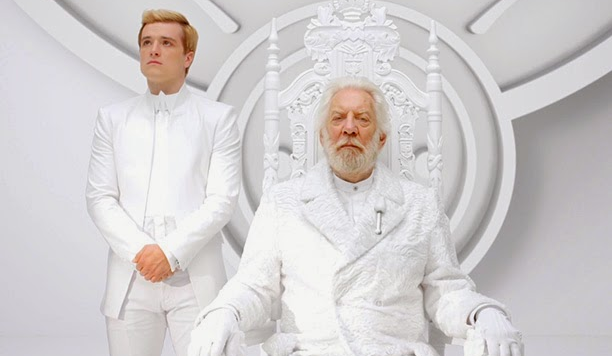 Eyewitnesses say Mellark arrived in the Capitol shortly after the Quarter Quell was interrupted by “technical difficulties” and has been often seen in the care of President Snow. Recent video transmissions from the Capitol confirmed rumors of the duo, showing Mellark standing next to Snow as he addresses Panem. The cryptic videos have citizens in the districts concerned about the fate of their beloved District 12 victor, but Mellark says not to worry. Mellark says he’s excited for the opportunity to actually get to do something useful for once and hopes to learn a thing or two from the other bakers. Mellark refused to comment on the subject of his estranged fiancee and criminal-at-large Katniss Everdeen, talking instead about the different styles of cake decorating that would be featured in the competition. “I don’t want to spoil anything, but it’s going to be great. You won’t want to miss it,” he added. President Snow explains that after the technical mishap in the Hunger Games arena and the disappearance of Head Gamemaker Plutarch Heavensbee, the Capitol decided to take the concept in a different direction. In the press release, the Gamemakers hint that there will be plenty of action despite the lack of violence present in modern baking. Producers expect ratings to be phenomenal since viewing will be mandatory. Originally published on Reel News Network.